Few stories have captured the hearts of Hurricanes fans like that of Rusty Medearis, who reached the highest of heights and the lowest of lows, but fought back with grit and determination that inspired thousands to cheer him on. He came to Miami from Ozark (Mo.) High School where he was a two-time All State and two-time conference MVP selection at outside linebacker. An all around athlete, he also lettered twice in baseball, basketball and track. But his story was just beginning to be told when he came to Coral Gables. His first collegiate start was the stuff of legends, as the freshman in recorded 5 ½ quarterback sacks of the Texas Tech quarterback to go along with 12 tackles, nine solo, and was named the Sports Illustrated defensive player of the week. 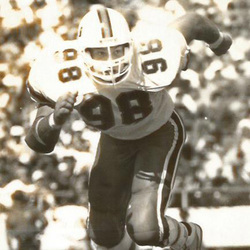 He was named a 1990 Freshman All-American and finished the year with 10 sacks, second only to UMSHoF member and 1990 Outland Trophy winner Russell Maryland's 10 ½ sacks. He also did double duty handling the Canes long-snapping duties. As a sophomore in 1991, Medearis had a knack for big plays in big games, recording two sacks against Houston's All-American quarterback David Klingler, 2 ½ sacks against Penn State, two against FSU in the Wide Right 1 game, and would record four sacks in Miami's 22-0 victory over Nebraska in the Orange Bowl for the Canes 4th National Championship. Rusty, named All-Big East and 2nd team All-American, teamed with Class of 2015 inductee Kevin Patrick as the Miami defense emerged as the number one defensive squad in the country, allowing just 9.1 points per game. Named a pre-season All-American by several publications, Rusty would suffer a devastating knee injury in the third game of the season, an injury that required 13 hours of surgery and countless hours of grueling treatment and therapy. Through it all, Rusty was determined to get back on the Orange Bowl field, and inspired Canes fans by starting the first two games of the 1994 season, recording 6 tackles. But the chronic pain from the injury finally forced him to retire from competition. His 22 sacks in just over two full seasons ranks tied for 7th in school history.